WE MARKED THIS ITEM AS USED BECAUSE IT WAS PREVIOUSLY OWNED. IT APPEARS TO BE LIKE NEW! This model offers all the working features you expect in an LGB loco, like interior lighting and directional lanterns with voltage stabilization. Starting in 1943, the Rhätische Bahn rebuilt some of its “boxcab” locomotives for switching. The center cab of the new “flatiron” body allows the engineer to operate the loco in both directions without having to walk from one end of the loco to the other. The 1920s livery of this LGB model was inspired by many, many customer requests. The fascinating motions of the loco’s rod drive are faithfully reproduced. Of course, this model offers all the working features you expect in an LGB loco, like interior lighting and directional lanterns with voltage stabilization. In 1913, the Rhätische Bahn purchased seven small electric locos for their line from St. Moritz to Scoul. These class “Ge 2/4” locos were numbered 201-207. 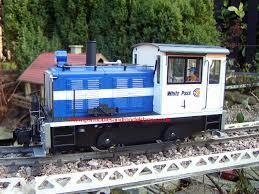 Starting in the mid-1940s, some of these locomotives were rebuilt into switching locos. A new body with a center cab provided unrestricted vision in all directions. Over the years, the locomotives were painted in the various paint schemes of the RhB. 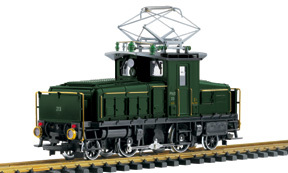 The LGB model carries the traditional green livery of the RhB during the 1920s.